Hyundai Motor, whose sedan-heavy lineup has held it back in a U.S. market powered by sport utility vehicles, is considering developing larger SUVs based on its Genesis luxury sedan, four people familiar with the matter told Reuters. It could take two or three years for the vehicle to go on sale, however, and the South Korean firm's poor track record with bigger SUVs, and its lack of pickup trucks, underscore the challenges in cracking the high-margin market for utility vehicles dominated by U.S. and Japanese rivals. There is no certainty Hyundai will bring the new vehicle to market, one of the people said, given concerns about its lack of brand power in the higher-priced SUV segment, and whether oil prices could surge again and erode the market for gas-guzzlers. "We are timid when it comes to bigger SUVs," said the person familiar with Hyundai's vehicle development, who did not want to be named as he is not authorized to speak to the media. The automaker is considering an internal proposal made last year to develop Genesis-based SUVs to fill a gap at the high end of its SUV range, said a second person with knowledge of the matter. The aim would be to plug into the appeal of the Genesis to elevate Hyundai's overall brand image. U.S. sales of the Genesis jumped by more than a third in January-May to nearly 15,000, far outpacing Hyundai's overall sales gains of just 2 percent. At the end of next month, Hyundai will halt production of its biggest SUV, the Veracruz, according to the newspaper published by its South Korean labor union. 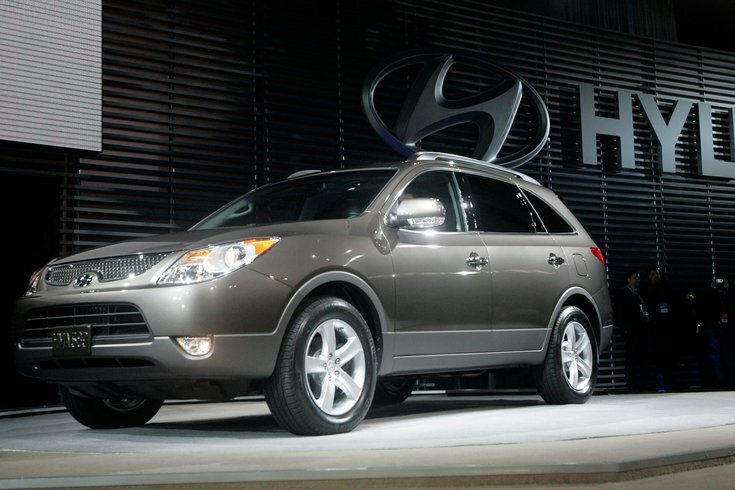 Last year, Hyundai sold fewer than 5,000 of its Veracruz, all in South Korea, compared with 54,325 globally in 2007. Hyundai confirmed the discontinuation of the Veracruz, but said "this does not mean we are giving up on a large SUV line-up." "We are considering developing premium, large SUVs based on customers' needs. We plan to respond to the fast-changing market centered around SUVs by beefing up our SUV line-up," it said in an emailed response to Reuters' inquiries. Once an outperformer in the United States, Hyundai's May sales there fell 10 percent from a year earlier, the sharpest drop in nearly five years and lagging the market's 2 percent gain. Hyundai shares are down 18 percent in 2015, the worst performing among major global automakers, also hit by a weak yen that benefits Japanese rivals. Sales of SUVs and trucks are booming in the United States and South Korea, Hyundai's second and third-biggest markets after China, but Hyundai offers only two SUVs in the U.S. - the compact Tucson and the mid-sized Santa Fe, and no pickups. In contrast, Toyota Motor's American lineup features eight SUVs and two pickups. "Overall, Hyundai needs to have competitive entries in the midsize, compact and sub-compact CUV/SUV segments," said Tom Libby, manager, loyalty and industry analysis at research firm IHS Automotive. Of all new Hyundai vehicles registered in the United States last year, 21.4 percent were CUVs (crossover utility vehicles) or SUVs, compared with 33.9 percent for the industry, according to IHS Automotive. Hyundai's caution over making big SUVs with three rows of seats is born of experience. In 2007, it brought the Veracruz to the United States, positioning it as a luxury model, but stopped selling it there in 2013 as sales dwindled. In 2011, sister company Kia Motors pulled its largest SUV, the Borrego or Mohave, from the U.S. market just three years after launch. "Oil prices are cheap now, but nobody knows how that's going to change. Mohave was a good vehicle, but its sales fell as fuel prices rose," the first individual said. Even where it has had SUV success with its Tucson compact, Hyundai is constrained by tight capacity, and a second South Korean production line to supply markets including the United States won't be online until September. A planned U.S. factory to make SUVs will enter production only in 2017, a source told Reuters previously. Hyundai has said it is considering developing its first pickup, based on its Santa Cruz mid-sized concept, to give it some play in the United States where pickups account for 14 percent of vehicle sales, according to IHS data.